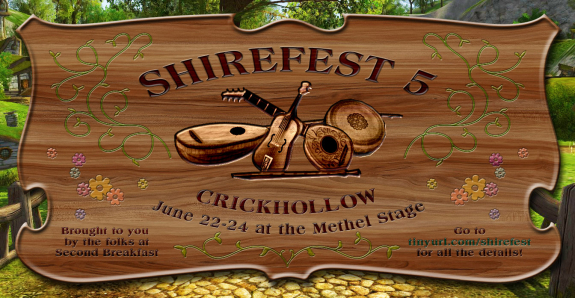 Crickhollow's biggest event returns to the Methel-stage this June! We'll feature 27 bands from all over the in-game (and out-of-game) world during our 3-day weekend. Everyone is welcome to share their own songs at Bread & Jam and Elevenses. The main show will take place at the beautiful Methel-stage in Tookland, just south-west of Bywater in, you guessed it, the Shire [32.6S, 69.9W]. Bread & Jam and Elevenses will both be held nearby at the Green Dragon in Bywater [31.8S, 69.9]. All times are EDT/server time (-4 GMT). SHIREFEST is coming back this June--look for an announcement soon! Somewhere, something incredible is waiting to be known - Carl Sagan. Electronic Gaming since 1980. Pontin is correct, it is EDT/server time. I almost never forget to include that so I'm quite sorry that I forgot it this time around. I think server time is generally assumed unless noted otherwise but it was rude of me to accidentally leave it out. This year is going to be soooo much fun! We have a ton of returning Shirefest veteran bands, and a bunch of new bands joining us! I can't wait! and then healed by laughter and song. your foes may be many, but you are strong. laugh in the face of danger. Some of us on LOTROstream will be doing a bit of broadcasting of this event starting on Friday. Due to real life conflicts, it doesn't look like we'll be able to stream the whole thing, but I'll be on from about 3-5, and Druidsfire should be able to stream some of Friday and Saturday as well. You can find it at Twitch.tv/LOTROstream if interested. Good luck to all bands and organizers! Have fun this weekend. That's great news, Cordovan! Many thanks to you, Druidsfire, and the LOTROstream crew! You guys have been doing a great job of supporting player-led events. Let the Shirefest countdown begin! Do drop in! The doors are always open! Breakfast: the best meals of the day! I want to express my profound thanks to everyone who made this year's Shirefest such a success! Whether you volunteered as an emcee,played music, livestreamed, took screenshots, recorded video, sang, danced,kissed, hugged, sent out Tweets, ported people, kept the chat flowing, or simply attended the event and enjoyed it--whatever you did was important! It was so gratifying to open the kinship panel and see the long list of Second Breakfasters in Tookland throughout the weekend! We ran a three-day event featuring 27 bands and at least 32 hours of music that ran a few minutes late just once due to a broken .abc file. Guests were polite and enthusiastic. Every band was incredibly professional and clearly brought their very best music and lyrics to Crickhollow! Special shout-outs go to Rosalie for being the mastermind behind Shirefest for the past 5 years and for making extraordinary preparations;to Standing Stone Games for supporting player-led events like this one; to Cordovan for streaming and for dealing with the sole griefer quickly and forcefully; to Phoenix for an epic LotroStream; to the musicians and lyricists who pour their hearts and souls into making beautiful songs for us; to the developers who brought us fiddles galore; and to Hollyberry and Miss Treacletoes for the phenomenal videography we'll have available on YouTube. Like all performance art, what we do here is ephemeral, but through the efforts of some very dedicated people it will be preserved for all our tomorrows--even after we depart for the West. This year I was able to be online for the entire festival (and a bit more!) and I can truly say the hours flew by because it was so much fun. I am proud and honored to be a resident of Crickhollow, known for its friendliness and hospitality, and to be the leader of Second Breakfast kinship, known for its . . . friendliness and hospitality! I may be biased, but I believe we epitomize all the positive qualities of Crickhollow and I'm thrilled that our kinship and home server can be represented on such a wide stage through Shirefest. So mark your calendars--I'm looking forward to seeing you all at the Methel-stage for Shirefest VI in 2019!